Ohio Attorney General Mike DeWine warned Cleveland Cavaliers fans to beware of phony offers for tickets to see the Cavs face the Golden State Warriors in the NBA Finals Thursday in Cleveland. Ticket scammers often post phony ads on Craigslist offering tickets to popular events at a good price. Victims pay for the tickets, generally by wiring the money or buying a prepaid card and providing the card number, but they receive nothing in return. In December, two Ohioans lost $800 each trying to buy tickets to see Ohio State play Alabama in the 2015 Sugar Bowl. They found offers for tickets on Craigslist and sent payment to the sellers but never received the tickets. 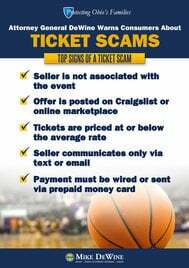 Attorney General DeWine’s office has pursued several criminal cases involving ticket scams, including one against a Coshocton husband and wife who took more than $200,000 from hundreds of victims throughout the U.S. and Canada by selling but never delivering tickets to events like the NBA Finals, Super Bowl, and concerts. Be skeptical of offers that are too good to be true. Sellers on Craigslist or other online marketplaces may offer tickets at face value (or below) for events that are sold out or highly in demand, but these offers may be scams. Don’t trust sellers who say you must pay via wire transfer or prepaid money card. These are preferred payment methods for scam artists, because once the money is sent, it is very difficult to recover. Ohioans can report potential scams by calling the Ohio Attorney General’s Office at 800-282-0515 or visiting www.OhioAttorneyGeneral.gov. They also can report suspicious Craigslist ads to the Ohio Attorney General’s Office directly from Craigslist at https://www.craigslist.org/about/scams.